We often have guests to stay who want to know more about the surrounding hills. They may have heard about the Long Mynd or the Stiperstones, but they’re not quite sure where they are. That’s when we use our handy (if you’ll pardon the pun) trick to explaining the layout of the Shropshire Hills. 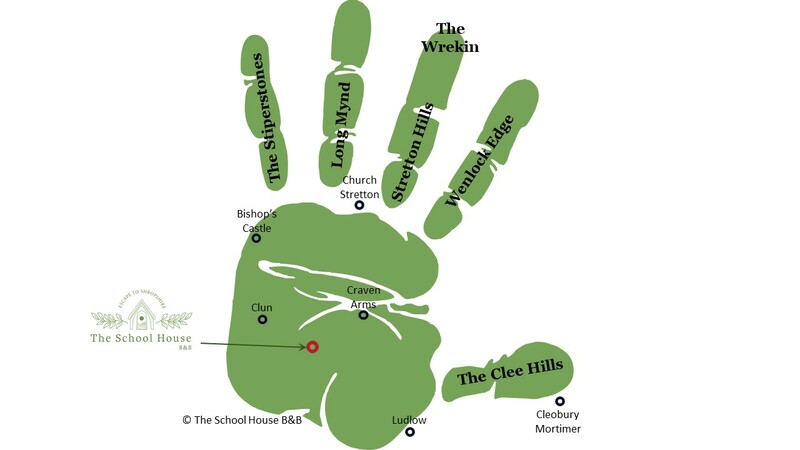 While there’s clearly a lot going on in the ‘fingers’, the ‘palm’ has plenty to offer with far-reaching views of each of the ridges. This area has many hills and valleys just waiting to be explored, including the Clun Valley and our very own Redlake Valley. On some of the hills that dominate the south-west region of the AONB there are remains of iron age hill forts, such as Bury Ditches (on Sunnyhill near Clun), and Caer Caradoc here in Chapel Lawn. There are some great walks and cycle rides to be found on the Shropshire’s Great Outdoors website. We also have a folder of routes and plenty of leaflets and books for you to browse through when you get here. There are 4 or 5 great walks you can do right from our doorstep - and not all of them involve climbing hills if you'd rather stick to a low-level walk. We're dog friendly here at The School House so if you're bringing your dog with you we can recommend walks for you and your four-legged friend too. 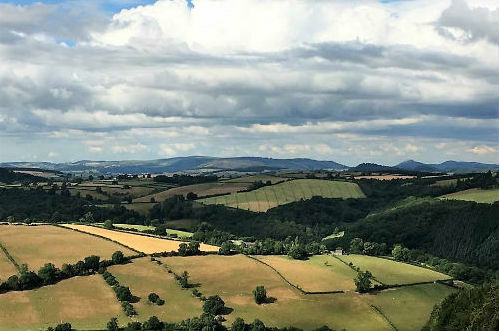 So, whether you're a walker, a cyclist, a dog owner, an ancient historian, or just someone who enjoys the outdoors and a break away from your busy lifestyle, we think the Shropshire Hills wins hands down!